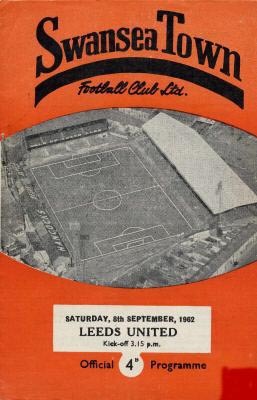 Date: Saturday, 8th September 1962. Scorers: Swansea Town: Nil. Leeds United: Johnson, Bremner. Swansea Town: Dwyer; Hughes, Griffiths; P.Davies, Purcell, Saunders; Jones, Thomas, Webster, H.Williams, Morgan. 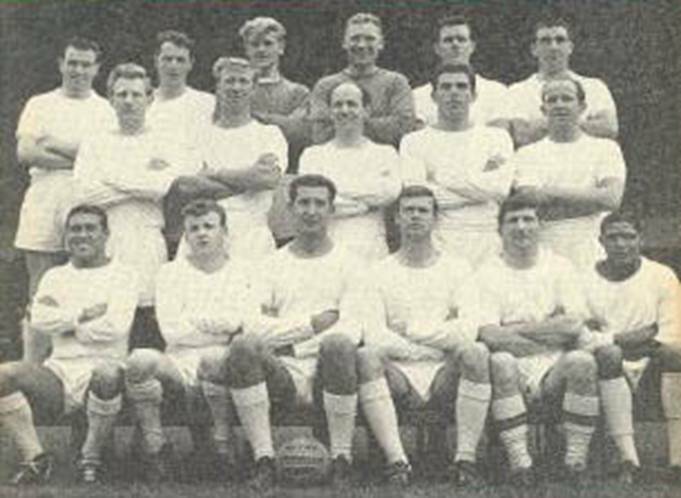 Leeds United: Sprake; Reaney, Mason; Smith, Charlton, Hunter; Peyton, Bremner, Johnson, Collins, Johanneson. After finishing fourth from bottom in the previous season and narrowly avoiding relegation, Leeds opened up the cheque book and brought John Charles back from Italy for £53,000 and invested a further £15,000 in the talented Scotsman Jim Storrie from Airdrie. After Storrie had given United both points on the opening day at Stoke City, indifferent results saw United languishing in thirteenth spot with their Welsh hosts three places better off. Unfortunately for Leeds their two expensive signings were both injured and they were charged with replacing their two star players and others who had been underperforming if they were to get themselves out of the doldrums. 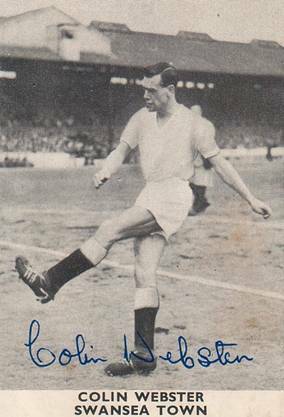 In addition to Charles and Storrie, United also had Club Captain Freddie Goodwin, as well as Willie Bell and Ian Lawson on the injured list and it was already a bare-bones team. Revie and his coach, Syd Owen, had gathered and groomed some outstanding young talent into United’s junior team and they had been given their chance in the Reserves. 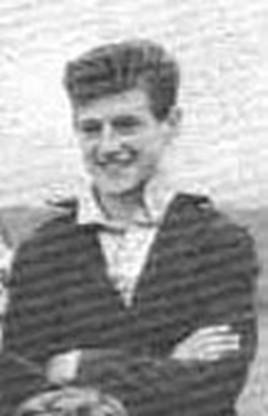 They included a fifteen-year-old Peter Lorimer, sixteen-year-old Barrie Wright, seventeen-year-olds Gary Sprake, Paul Reaney, Paul Madeley, and Rodney Johnson, eighteen-year- olds Norman Hunter and Terry Cooper, as well as Mike Addy (nineteen) and two twenty-year-olds in Ronnie Blackburn and John Hawksby. 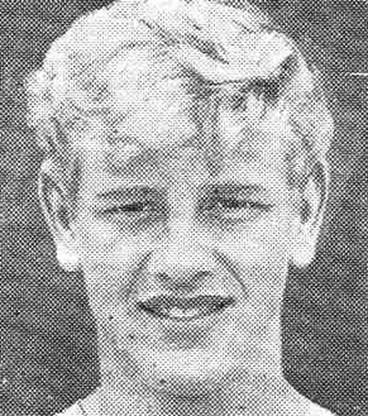 Hawksby, an England Youth International, had already played over thirty times for the first team and Sprake and Addy had made single appearances. Billy Bremner, though still only nineteen was already a seasoned veteran with over eighty League appearances to his credit. 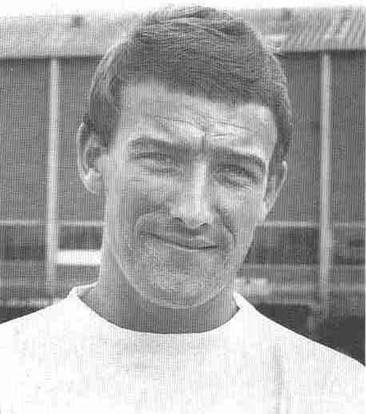 There had been an extremely lack-lustre display in a previous game at Bury and Revie made the decision to give youth a chance, dropping the vastly experienced though aging Tommy Younger and Grenville Hair. 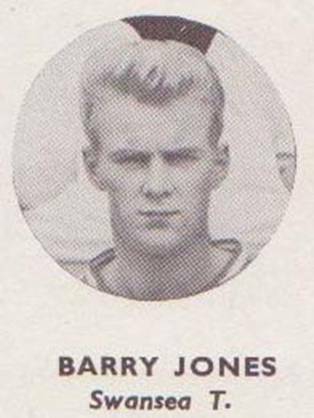 He chose to give debuts to Paul Reaney, Norman Hunter and Rodney Johnson and a second game to Gary Sprake as the three defenders had often combined in the Junior and Reserve teams. 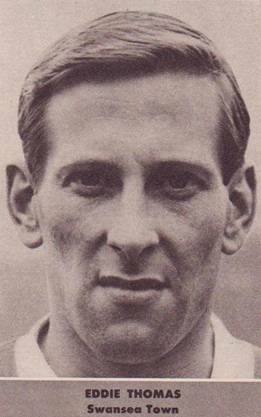 Cliff Mason took the captain’s armband, but it was the irrepressible Bobby Collins who led by example on the pitch and the “old hands” Eric Smith, Jack Charlton, Billy Bremner, Noel Peyton and Albert Johanneson who helped the newcomers. Understandably the new combination took time to settle and Sprake, playing in front of his native crowd, was called upon to show his goalkeeping prowess in the early minutes, twice saving comfortably from the Swansea attackers. This helped to settle the Leeds defence and give them confidence, but it could have been different as Swansea’s Colin Webster had the ball in the net, but it was disallowed for offside. United settled to playing a high pressure game, hustling and closing down their opponents at ever opportunity, while Bobby Collins sprayed the ball into space for the eager youngster to exploit their speed and enthusiasm with raids down the wings and forward breaks. It was a style that was to become familiar to Britain and Europe in the next decade and a half, but for now it could be seen that the blend of experience, in the form of Bobby Collins, and the youthful skill and exuberance of the rest were giving Swansea plenty of trouble, after the home team had dominated the early part of the game..
United took the lead as Albert Johanneson went on one of his mazy runs down the left, taking several Swansea defenders with him, before finding Billy Bremner in space, who in turn found Rod Johnson with a fine through ball. The former Cow Close schoolboy evaded a couple of tackles before beating the Swans goalkeeper, Noel Dwyer, with a low drive from an acute angle, after eleven minutes. Collins and Bremner were starting to control the midfield and the pair, and Noel Peyton, went close to increasing the lead. Johnson and Johanneson had good efforts late in the half and there were a couple of spectacular long range drives from Hunter, as United pressed home their advantage. 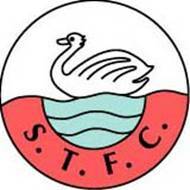 The Swans were not a spent force, but with Jackie Charlton in rare form and Sprake drawing applause for his efficient handling of all situations, they did not pose a serious threat and half-time came with Johnson and Smith both going close. The Welsh side came out for the second half with guns blazing. However, Charlton was resolute, first blocking an attempt by Webster and then heading away under pressure when Davies threw the ball into the area. It was only temporary and soon United were two to the good, with a goal that was outstanding. 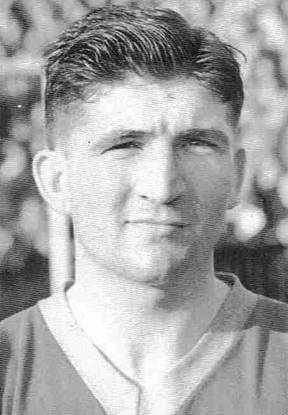 Johanneson began the move, dancing his way down his wing before finding Collins, who took the ball on before passing to the Bremner, who controlled it before rounding former United trialist and Welsh International, Harry Griffiths, to hammer a tremendous shot past the keeper from ten yards. 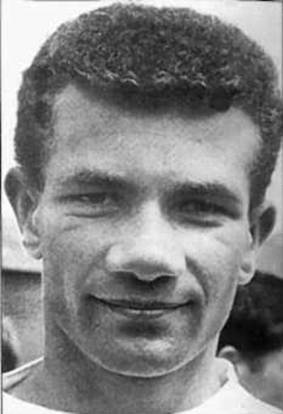 The young Rod Johnson had given his all and on the hour he was carried off after a collision with the much larger Swansea keeper, Noel Dwyer. United carried on with ten men, until he returned after twelve minutes, but he was clearly still feeling the effects and this caused him to miss several ensuing games. The ten men handled the situation well and pulled off a memorable victory, but more importantly the embryo of United’s future success was on display for all to see. 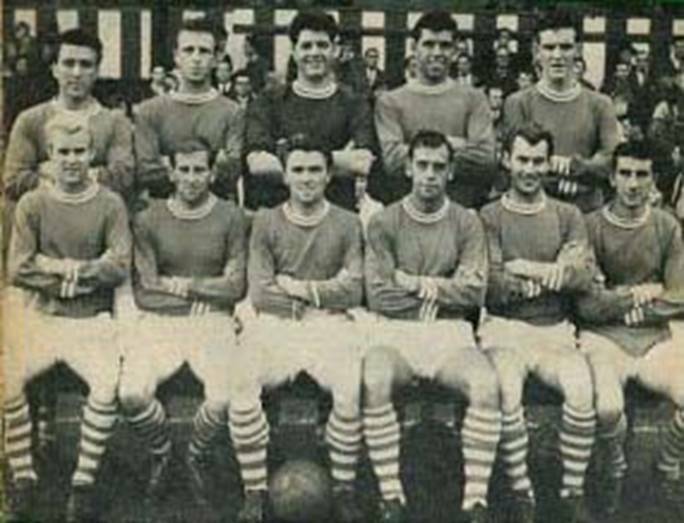 Back Row: Roy Saunders, Brian Hughes, Noel Dwyer, Mel Nurse, Peter Davies.